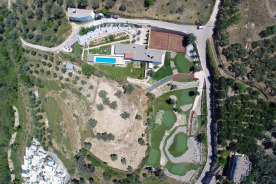 This is the only villa on the island that boasts not only a 60 sq.m swimming pool, tennis court, football pitch, fitness room but also a 6 hole private golf course with artificial turf! This unique villa has a living space of 250 sq.m and set on a 6000 sq.m private plot. The property consists of 5 bedrooms with double beds, 4 bathrooms, fully fitted kitchen and two spacious lounge areas. 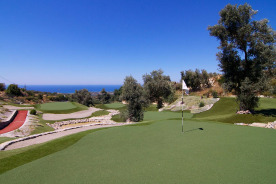 The highlight of the villa though is a 4000 sq.m private pitch and put course designed by the Swedish golf course designer Christian Lundin. 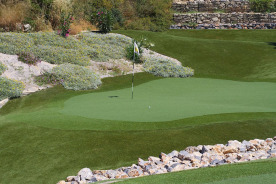 The entire field is artificial turf, as well as rough fairway and greens with water obstacles and real bunkers. 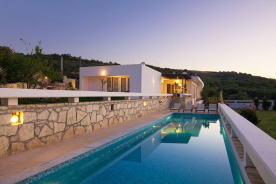 The villa and its vast grounds are surrounded by natural rugged beauty and stunning views of both the mountains and the sea, providing tranquility and seclusion while at the same time close to every amenity. Located just outside of Agia Paraskevi village, this property is ideal for those wishing to explore the island. To the east, you will find the islands capital city of Heraklion and the famous Place of Knossos. This magnificent historic site is said to be the start of European civilization. To the west is the beautiful Lake of Kournas, the only freshwater lake on the island. Further along the coast you will find Souda Bay with its panoramic views and serene war cemetery and just beyond here lays the cosmopolitan city of Hania, the former capital of Crete. Villa contains - 5 bedrooms with double beds. One bedroom has a couch bed. - 3 bathrooms, with showers, toilets and sinks - Air conditioning in bedrooms and underfloor heating. - Fully equipped kitchen. - 2 lounges with fireplaces - Library - Gym with desired equipment - 60 sq.m swimming pool. 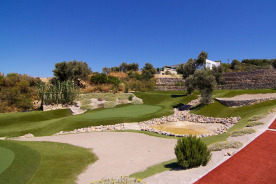 - 6 hole golf course with pitch and put options on artificial turf - Tennis court - Very attractive terraces and gardens. - Sun chairs, tables and umbrellas. - Private parking. - Washer and dryer - Stunning views of the Mediterranean. - Rethymnon city is only 15 min. away by car. - Lots of restaurants, taverns, bars and shops inside Rethymnon. - Wireless Internet.